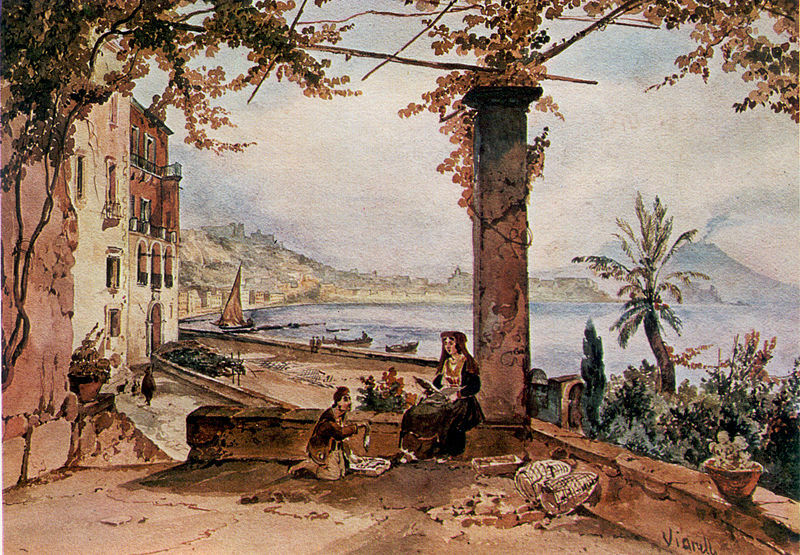 A painting by Achille Vianelli of the coastline at Posillipo. 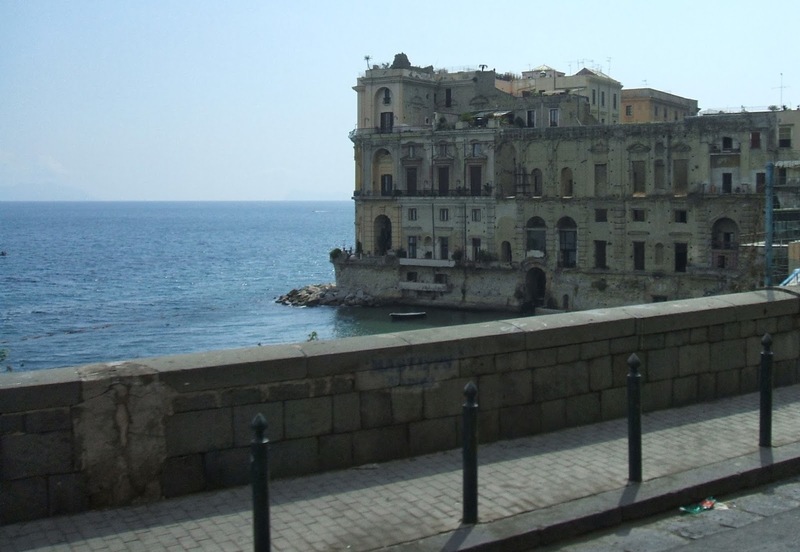 Vianelli was a member of the Posillipo School. The painter and printmaker Achille Vianelli, whose specialities were landscapes and genre pictures, notably in his adopted city of Naples, died on this day in 1894 in Benevento in Campania. For a while he worked at the French court, giving painting lessons to King Louis Philippe. Some of his works have sold for thousands of euros. 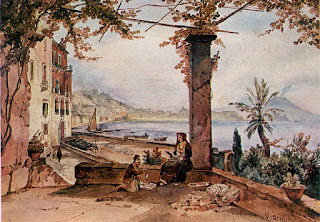 Vianelli was born in 1803 in Porto Maurizio in Liguria. 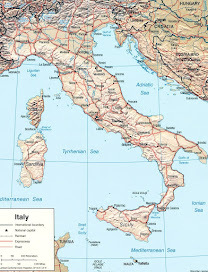 When he was a child, his family moved more than 1,200km (750 miles) to the other end of the Italian peninsula to the coastal town of Otranto in the province of Lecce, where his father, Giovan Battista Vianelli, Venetian-born but a French national, had been posted as a Napoleonic consular agent. Achille spent his youth in Otranto before, in 1819, he moved to Naples. 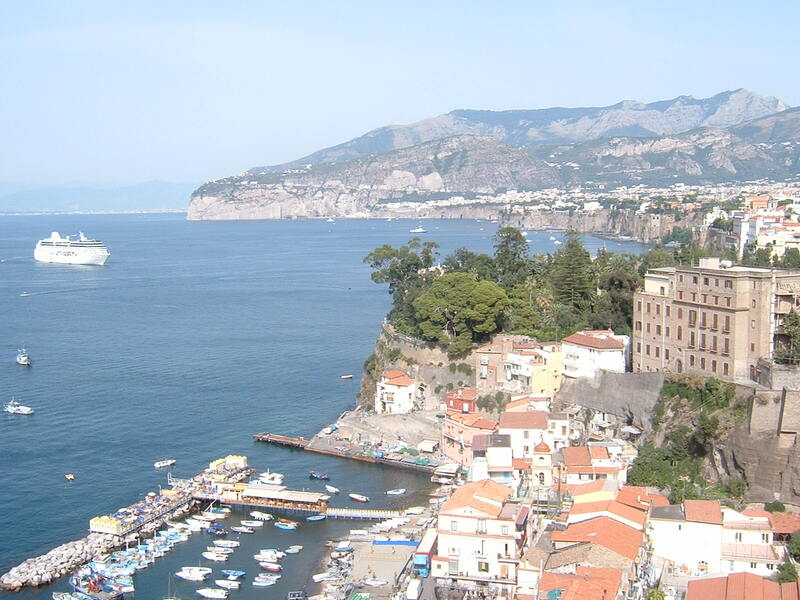 His father and sister moved to France, although they would return to Naples in 1826. Achille took a job in the Royal Topographic Office. In Naples, he became close friends with Giacinto Gigante, with whom he shared an interest in painting. Together, they studied landscape painting, attending the school of the German painter Wolfgang Hüber, after which Vianelli became a pupil of Anton Sminck van Pitloo, a professor at the Accademia di Belli Arti in Naples who had a studio in the Chiaia neighborhood of Naples. Pitloo is regarded as the father of the Posillipo School, a group of landscape painters, based in the Posillipo area of Naples, a stretch of coastline extending from Mergellina to the headland at Parco Virgiliano, overlooking the volcanic islet of Nisida, on the northern side of the Bay of Naples. Both Vianelli and Gigante were members of the Posillipo School, along with Teodoro Duclere, Vincenzo Franceschini, Consalvo Carelli and others. 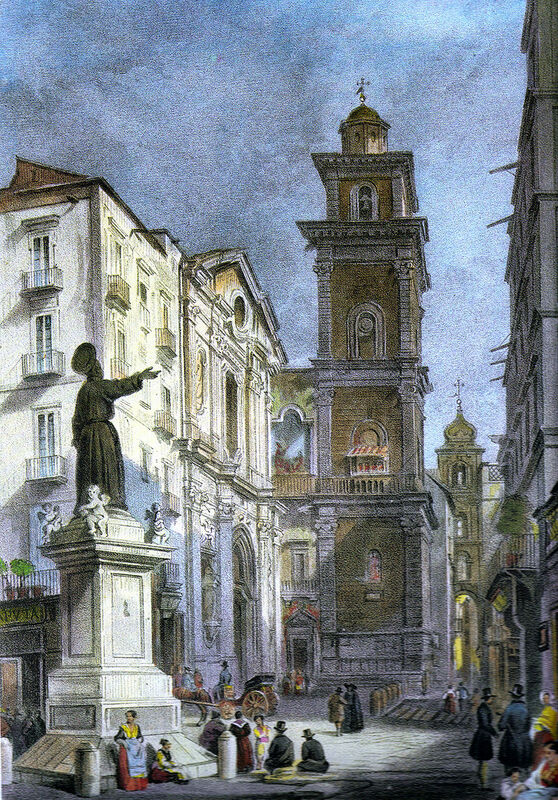 In the 1830s, Vianelli gradually moved away from oil landscape painting, increasingly devoting himself to perspective views of squares and church interiors, in watercolor. 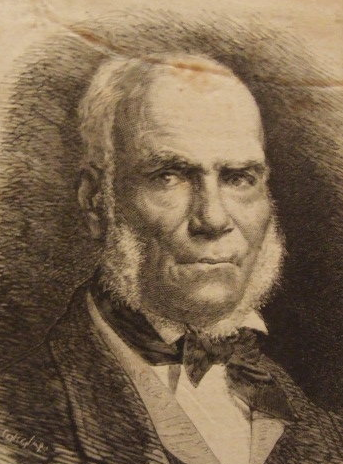 He experimented with sepia monochromes, of which he developed a valuable technique. Many of his views were etched or lithographed and published in books dedicated to the city of Naples. 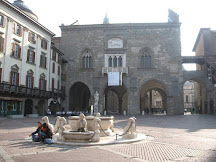 In 1848 he moved to Benevento, where he founded a drawing school in the Cloister of Santa Sofia. Among his students was Gaetano de Martini. 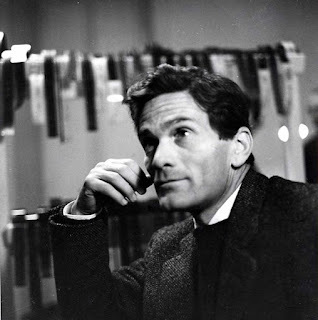 Vianelli enjoyed success with his work and his fame spread beyond Italy. King Louis Philippe invited him to give him painting lessons and Vianelli lived in France temporarily. 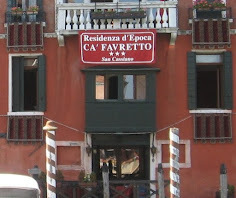 He died in Benevento, at the age of 91 years. His son Alberto, born in 1847, was also a landscape painter. A sister, Flora, had married Teodoro Witting, a German landscape painter and engraver active in Naples in 1826, while another sister, Eloisa, married Giacinto Gigante in 1831. In ancient times, Benevento was one of the most important cities in southern Italy, along the Via Appia trade route between Rome and Brindisi. The town is in an attractive location surrounded by the Apennine hills, and it suffered considerable damage during the Second World War, there are many Roman remains, including a triumphal arch erected in honour of Trajan and an amphitheatre, built by Hadrian, that held 10,000 spectators and is still in good condition. 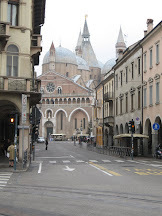 The cathedral of Santa Maria Assunta, originally built in the 13th century, has undergone major reconstruction work, while the original bronze doors for the cathedral are now kept inside the building.